Eds. note: this post is the second in a series of posts about songs from my last EP. “Saturday” is one of the more upbeat songs I’ve come up with, though the lyrics are a classic 90’s ironic slacker take on getting up late on a Saturday and feeling like you’re wasting your life. Ahh, to be 22 again. No thanks. I played it at shows for a while and maybe tried to record it at some point back then, I’m not sure. I know I played it live at Aurafice Cafe on March 16, 2001 because I had an mp3 of it on my website for a while. Coincidentally that’s how I met Seth Howard, he somehow found my site back then and emailed me. We still hang out all the time. Later I decided to record it “for real” just to have a memory of this song I’d written and I thought it would be easy and fun to do. I started recording in June 2005, and finished it just this past October 2017. What took so long? I can report I did not work on it continuously for 12 years. 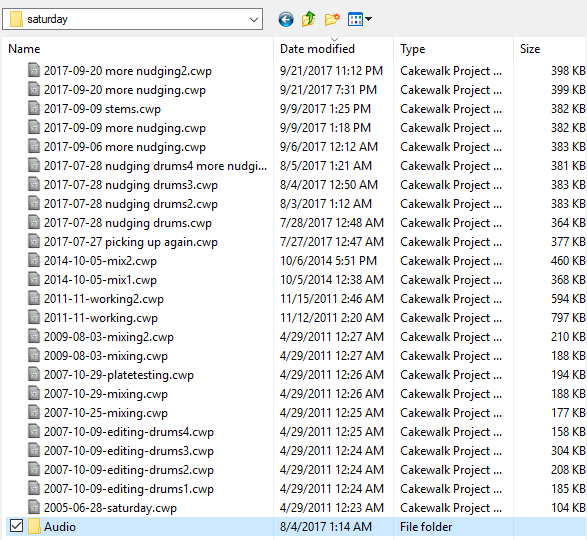 Instead I’d been picking up the audio project (in Cakewalk Sonar, RIP) every few years and messing with it, then dropping it again when it got tedious. It got tedious for one reason mainly: drums. I’ll usually start a recording with scratch guitar and vocals on top of fake drums (acting mainly as a metronome that’s more fun to play along with), then add real drums, then redo the other tracks to establish their “final,” better versions that are also more cohesive with the “final” drums. 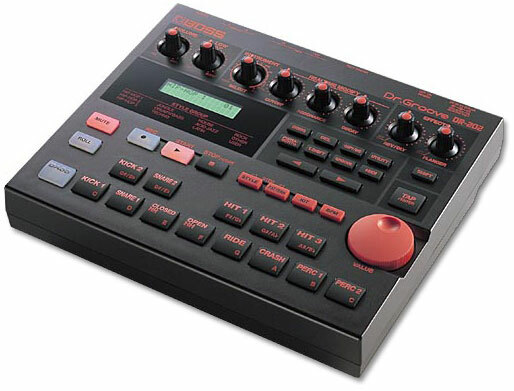 I used to get fake drums from the DR-202 til I sold it in favor of software plugins. I kind of miss it now. This song “swings” and getting that beat right on a drumkit wasn’t easy for me. 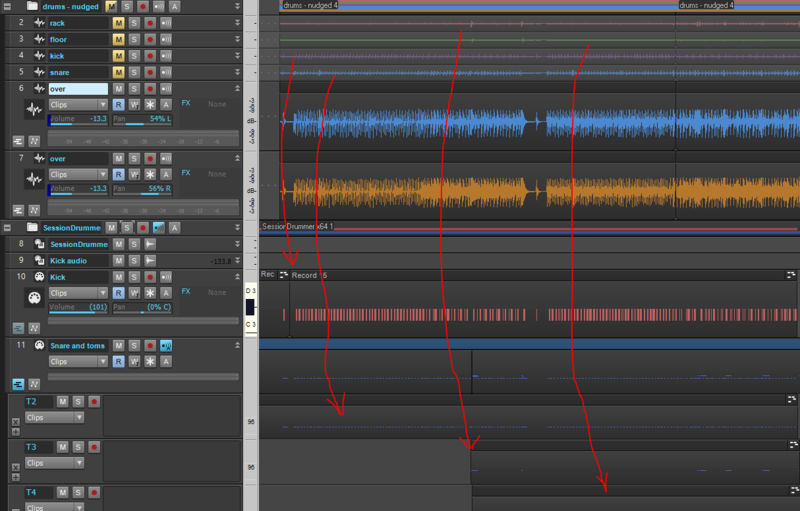 In fact I never got it right, but rather recorded some takes and then cut and pasted them up in Sonar. I remember spending hours and hours on the cutting and pasting in late 2007, at which time I also recorded most of the other parts (vocals, bass, guitar solos). Even after that though the drums weren’t right. I also took some sideways detours. This was shortly after I moved to Madrona and Seth (aforementioned) suggested I try building a plate reverb, presumably because one would fit in the basement. I tried building one and spent a lot of time at it, and in fact there are 2 noisy audio tracks (muted) of my vocals going through the plate. I did not use those. There are also muted samples of random TV commercials. For fun? No to those too. I know I picked the song up again at least 3 more times months and years apart, to try mixing and remixing it. Still not right. Things picked up in 2014 when I attended some sort of Sonar seminar/road show and learned that you could easily extract MIDI transients from audio tracks, and decided I should try that. I did, and it worked. What this did was to create MIDI containing the information of which drum was hit when in time and how hard. Now I could replace my kick, snare and toms with samples and I could move them around in time, make them louder, quieter, etc. I cut the low end out of the drum overhead tracks so that you can only hear the cymbals in those, and now the whole kit comprises sampled drums along with the “real” (edited, from my earlier work) cymbals. Quantizing moves notes to set locations in time, like say, to the quarter note. All notes that are “pretty close” to a quarter note location in time will get moved to that nearest quarter note as part of the quantize process. This makes it sound more like a machine playing but it’s better than a not-so-good drummer. So I tried quantizing, but I could not get it to work right. For one thing, the version of Sonar I use (X3) has a lousy user interface. It represents decades of tacking new features onto existing features without ever designing for the whole experience, and then moving things around so that you can’t find the things you use all the time because they’ve been moved somewhere else. Like the quantize function. But then also, the song swings, which apparently is hard to quantize, and it just would not work. So then another three years went by til I picked it up again and just moved the drum notes around by hand. It took a long long time. Then I sent it to mastering, and it came back with the kick drum really pronounced in the mix, so I could really hear that it still wasn’t right. So I worked on it some more and sent it back to mastering. And it was still bad. So I worked on it more, and then it was done. I should take a moment and acknowledge that this was not good time management. I should have tried again with a real drummer, or programmed a drum machine, or started over entirely. I swear 95% of the time spent on this song was on the drums and most of that was just the kick drum. Which ended up too quiet in the mix! I’m going to try not doing that again. On the plus side, I got to cross it off the list and put it on an EP. Hear it on Bandcamp. This entry was posted in Anatomy of a Song, Recordings, Sun Tunnels. Bookmark the permalink.